“In a Cornish house lives the widowed Stella, a woman of considerable gifts and beauty who regularly rejects proposals of marriage from her neighbour Robert Hanson. Cherry, Stella’s daughter, brings home her artist husband Evan for the first time and Stella is shocked by the bohemian incompleteness of their marriage. She finds herself attracted to Evan and soon they are passionately in love: although much is left unspoken, Evan eventually compels Stella to admit her feelings”. A synopsis of the play ‘September Tide written by Daphne du Maurier. Some month back this play was put on by The Sudbury dramatics Society (SDS) at the Quay Theatre in Sudbury. The director asked me if I would assist in taking some photographs and creating an advertising poster / banner for the event. 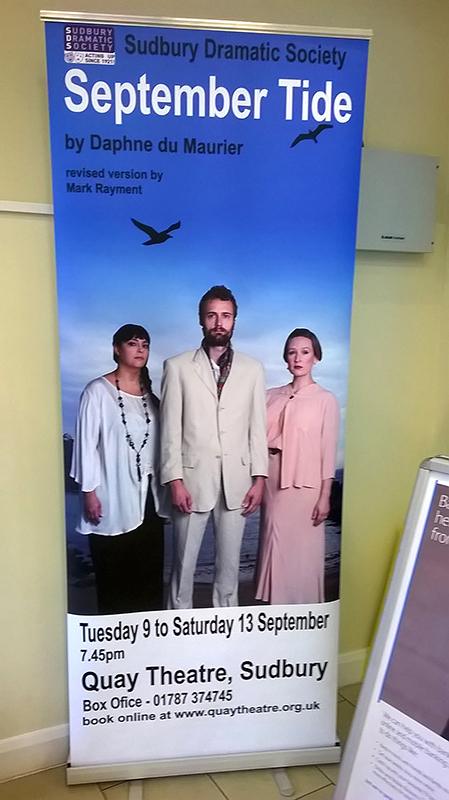 The image below is the banner I created, the final image was a composite of a photograph of the three actors taken against a wall in a local hall composited with an image of a sea and cliff scene taken on the Cornish coast.